[5a Then he [Elijah] lay down under the tree and fell asleep.] 5b All at once an angel touched him and said, “Get up and eat.” 6 He looked around, and there by his head was a cake of bread baked over hot coals, and a jar of water. He ate and drank and then lay down again. Unspecified in the Bible text. Afternoon. Elijah the prophet. An angel of God. 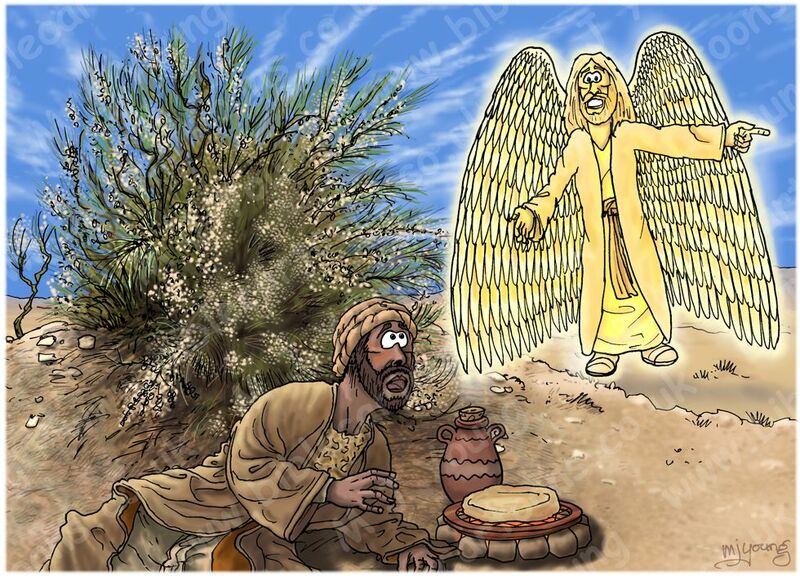 This scene shows a very surprised looking Elijah, under a broom shrub, in the desert wilderness, looking up at an angel of God. 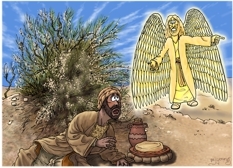 The angel is indicating the bread and water at Elijah’s head with his right hand and the direction of Horeb, the mountain of God, with his left. I have used the same background and broom shrub from the previous scene (Scene 02 – Broom desperation), but have “panned” the view to the right, to provide more open space to place the angel in. For my notes on the geology and Broom shrub, see the previous page, Scene 02 – Broom desperation. For maps regarding this location, see the previous page, Scene 02 – Broom desperation.